Get a jump start on summer with our flower crown workshop! In this class, Laura will share tricks for selecting and preserving fresh flowers in a way that maintains their color, suppleness, and vibrancy, so you'll never have to look at a crispy brown bloom again. 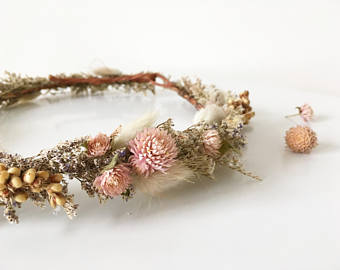 Following a brief lesson, you'll be guided though a hands-on workshop where you'll design and create your own colorful and vibrant dried flower crown—just in time for summer..
All required materials, floral & instruction are included. Guests will be able to take their creation home with them to enjoy! Until We Wed is a floral company based in New York City, specializing in weddings + events. It is owned and operated by Laura Mae Pfeffer, who designs with a modern, textured, and relaxed aesthetic. All flowers are hand-selected and thoughtfully paired to create arrangements that follow the natural beauty and flow of each bloom.